If you are familiar with the local and regional motorsports scene, the name SK Garage probably rings a bell. As a workshop known for its handywork with Hondas, such as the Civic Type R, and more recently continental performance makes such as the Mercedes-AMG A 45, the man behind SK Garage, Jonathan Xie, is no stranger when it comes to maintaining and modifying cars. At one corner of the workshop, you can see a row of trophies that line the wall. 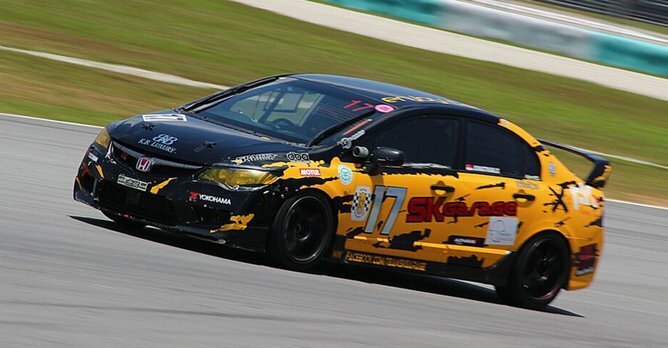 SK Garage's latest success was at Sepang International Circuit, where Jonathan and the SK Garage team secured podium finishes in the last few rounds of the Malaysian Championship Series (MCS). But it wasn't all about the glitz and glamour of winning races when SK Garage first started out. 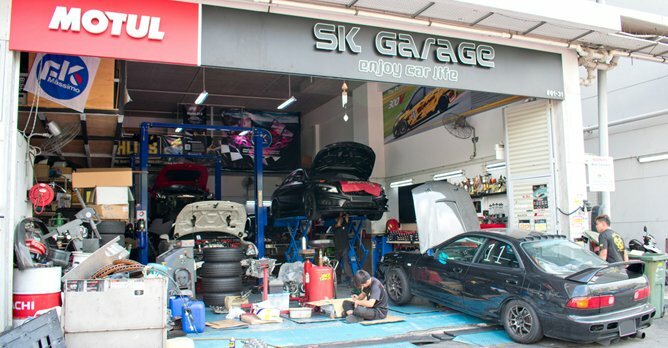 SK Garage was formerly known as Seah Kwang Seng Motor Services. Ran by Jonathan's father, it mainly focused on commercial vehicles. It all started when Jonathan bought his first car, a Honda Civic EG6, that got him into the business of meddling with cars. It was almost natural that he would follow in his father's footsteps, but now in the field of performance modifications, too. Soon enough, he started tinkering around with his Civic, which attracted some attention from friends. Jonathan would test out modifications and upgrades on his own car and learned along the way on what works or doesn't, before trusting his friends with his work. These friends soon turned into customers, and thus, a new chapter began. Moving away from commercial vehicles, we now have SK Garage. SK Garage is a workshop that does regular maintenance, as well as modifications and upgrades. Their services include ECU tuning, gear ratio fabrication and other power enhancement services. It's not all about gleaming workstations and luxurious waiting lounges when you step into SK Garage. In fact, some may find that it is a mess. But you should never judge a book by its cover. In this mess you'll find the most desired cars entrusted to SK Garage that are a testament to the firm's abilities, such as a Nissan GT-R, the Mitsubishi Lancer Evolution and a Mercedes-AMG CLA 45 that are awaiting modifications and maintenance work. There was even a Ferrari California sitting outside the workshop after some modifications, waiting for its owner to collect it. Jonathan is all hands on deck, working on the cars amongst his mechanics. What is so unique about SK Garage is its participation in motorsports. As Soichiro Honda, the founder of Honda said himself, "Racing improves the breed." With his trusted Honda Civic Type R, Jonathan and his crew are going all out when it comes to racing, while learning and improving along the way. With their podium finishes in the last MCS race, it goes to show that despite the odds, you will enjoy the fruits of your labour. While other racing teams and garages have their own set of drivers and teams working on the car, Jonathan will race, as well as work on the car. Sometimes, this may mean working throughout the night to get the car race ready by the following day. It is a big effort supported by his mechanics, friends and customers. With the MCS season over, SK Garage is taking a step further by participating in the Sepang 1000km Endurance Race, happening next month. SK Garage will be racing its Honda Jazz in the race. The Sepang 1000km Endurance Race will bring a new set of challenges for SK Garage, especially in terms of logistics and funding, as Jonathan shared that he will be bringing four spare engines in a few cars. "I sold my car parts and my own watches to fund this, some people thought I was crazy," Jonathan added. With passionate friends and customers that help out on race days, it is no wonder that earlier this year SK Garage took on a 2,700km road trip to Thailand. As a testament to its workmanship, all nine cars, some of which were race-ready, came back in one piece, with no breakdowns that occurred. SK Garage is actively looking for partners and sponsors for its pursuit in motorsports. At the same time, the guys at SK Garage are encouraging those who are interested in experiencing motorsports, or move up to a more professional level in racing, to join them in their pursuit. SK Garage is located at iSpace, 7 Soon Lee Street, #01-31, Singapore (627608), and is open on Monday to Saturday, 10:00am to 7:00pm. You can check out its Facebook page for more products and services, as well as its motorsports activities. Things to be careful after PPS?